CodeMix 3 now available! Check out the CodeMix Journey. Webclipse has been rebranded as CodeMix. The next gen architecture in CodeMix allows you to be a part of the modern-web movement while remaining in the Eclipse IDE you are familiar with. You still get the Webclipse features you love, just more good stuff! CodeMix is free to try, and if you’ve already purchased a Webclipse license, it works in CodeMix. Get CodeMix—the next generation of Webclipse! 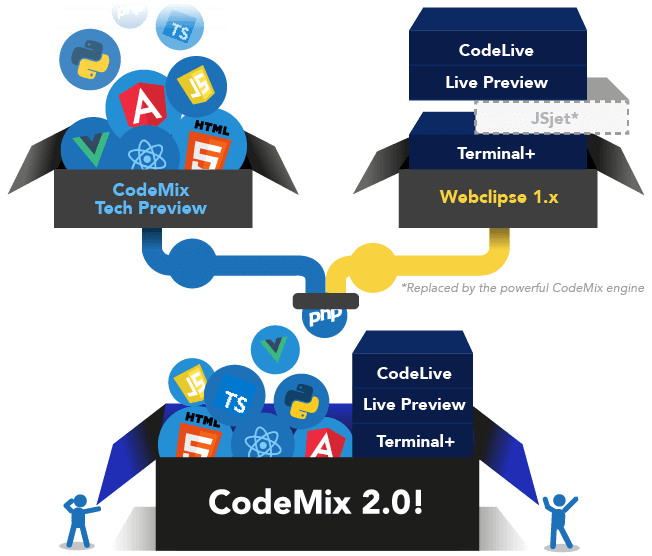 If you have a current Webclipse personal or commercial license, there’s no need to wait to upgrade to CodeMix. You’re existing license will work—even with all that extra goodness you get in CodeMix. We’ve also added the option for a 30-day license and made changes to our free license. New CodeMix personal licenses are automatically managed via genuitec.com. If you have an existing Webclipse license, your license is automatically migrated to a commercial license to recognize your license key, without any interruption to your workflow. CodeMix commercial licenses use a license key. If you have an existing Webclipse license, CodeMix uses your Webclipse license automatically. Don’t need an annual license? No problem! You now have the option to purchase a 30-day license for just $5. The limited free license in Webclipse has been replaced with an unlimited 45-day trial license in CodeMix—you can really dive into your coding to make sure CodeMix is right for you! Visit the FAQ page to get answers to questions you might have. It’s simple to download CodeMix from either the Eclipse Marketplace or the Genuitec update site. Visit our learning center for a variety of articles to help you master CodeMix.